Over the weekend I decided to give the hedges in the front yard a much needed buzz cut with the electric trimmers while the hubby was out golfing. By the time I got around to the final boxwood I had pretty much exhausted all fantasies of being a hairstylist for the military, I was hot, thirsty, and my arms felt like rubber bands but I only needed to make one final swipe…Have you ever done something even though you knew better? I saw that the extension cord had been pulled up into the bush and was resting rather close to that last group of shaggy limbs but I went ahead anyway and heaved that little trimmer through the air like I was Paul freakin’ Bunyan swinging an ax, and when it hit the power cord I’m not sure which came first, the loud popping noise or the flames. When the fireworks ended I found myself standing there like a fool waiting to die, waiting for that beautiful white light and for my grandmother to appear and whisk me away to the land of chubby cheeked cherubs and no yard work. But thanks to the insulating properties of plastic and the wonders of the modern day circuit breaker, the only land I visited that afternoon was the land of buzzing fluorescent lights and bright orange aprons where I plunked down twenty bucks for a new extension cord. Lesson of the day: If you think you know better, you probably do! Take the time to get the ladder out instead of standing on that wobbly lawn chair, don’t move the couch by yourself, and please don’t have just one more drink and then get behind the wheel of a car. When Mr. bookbabie got home from his leisurely round of golf he found me out on the deck reading my book. He said that he thought my accident may have been a case of Freudian power tool assassination. I didn’t argue. Instead, I took a long, slow sip of my iced tea while pointing innocently to his brand new extension cord that lay curled at the feet of a backyard battalion of untamed hedges. This entry was posted in my life, photos, quotes and tagged gardening, humor, photography, photos, quotes, safety by Lilli Day aka bookbabie. Bookmark the permalink. Oh my goodness. I’m glad you did not hurt yourself. I have thrown caution to the wind many times myself. Why do we chance it?? You’re a good woman for replacing the extension cord. I would have blamed my husband on not buying a cordless gadget. LOVE ADELE!!! Love her new Skyfall song from James Bond. Would love it if you would stop by my channel﻿ to check it out! All coemmnts are greatly received and maybe a sub!!! ahhh… i always wondered what would happen if…:) but now i know and won’t have to risk the exploration into the freudian unkown! 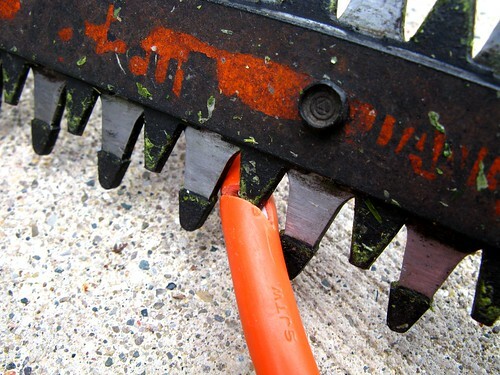 i LOVE yard work; blame my mom for that, my extension chord is a bit bandaged by black electric tape. Great; funny post. Glad all ended well for you, if not for the cord. Yikes! I’m glad you didn’t get electrocuted. Dangerous stuff, electricity. Hard to live without it, though. Thanks for stopping by our site! I have had so much fun reading yours! Truly hilarious. glad you are okay but what were you doing in the land of orange aprons?! You should be in the land of blue and red aprons! the jolt of electricity must have caused temporary insanity!! Oops, sorry Carrie, don’t tell Bob! Happy you’re still with us!!! Some might consider this a shamanic initiation! As far as doing things when you have that inkling that maybe you shouldn’t – we have intuition for a reason, but I have no clue why we don’t tune in more frequently. Maybe we really are too ‘busy’ in our heads. Oh my GOODNESS. I am so glad that you didn’t end up a Darwin award winner. I must confess that I have had a lot of “almosts” when it comes to power tools. Yikes! That’s scary! It could have ended much worse than that. It’s something that I have no doubt I will do at some point in the future… like the time I georged the george forman grill cord. Phew! glad you’re still with us! LOL, this story makes me laugh so hard. I’m glad you’re okay. I once vacuumed over a small, fragile cable when I knew better. No electricity was involved, but my husband was mad at me because the cable was important to him. Funny story…I made the mistake of looking out the bedroom window during a lightening storm. About the time I looked out lightening struck a tree in the back yard of a neighbors house….I was blind for a few minutes…I actually thought I would never see again. Won’t do that again.